How to control swelling after tummy tuck - Abdominoplasty? Julio Clavijo-Alvarez, M.D. Contents Procedures How to control swelling after tummy tuck - Abdominoplasty? This video will explain the reasons for swelling after tummy tuck – Abdominoplasty. Dr. Clavijo will also discuss ways to decrease swelling after abdominoplasty surgery. Understanding the normal pathways of blood flow to tissues. Human tissues survive by obtaining their nutrients through arterial blood IN-flow. Cell waste is removed by the venous blood OUT-flow. Sometimes there is fluid accumulation in the tissues. This fluid is removed by lymphatic pathways. How does surgery affect the tissue blood and lymphatic flow? Surgery causes an interruption of the normal pathways of blood and lymphatic flow to the tissues. This interruption results in accumulation of fluid in the tissues resulting in swelling. In addition, there is creation of fluid pockets (this is called a seroma). Swollen tissues and seromas are more likely to be present at the lower areas of the body. In some cases, the swelling may extend to the hips and thighs. How long does it take for the swelling and seromas to get better after surgery? Swelling and seromas are worse during the first 2 weeks. 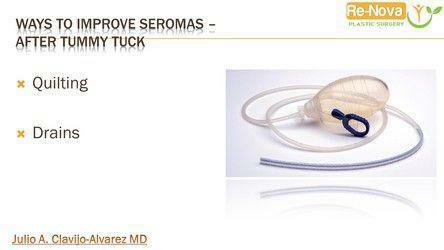 With proper compression and drainage, the swelling and seromas improve in the next 3 months. 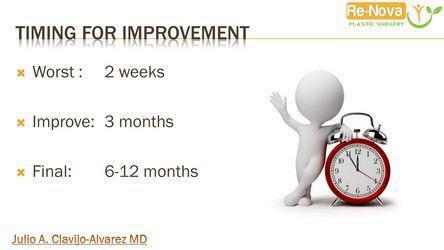 You should expect your final results to be visible by 6 months to a year. How to improve swelling and seromas after tummy tuck surgery? There are multiple things that can be done to try to decrease swelling and seromas after surgery. 1. Quilting technique: there are internal stitches that try to fix the elevated tissues down to the deeper tissues. While some surgeons do not use drains with this technique. I still think that is better to make sure that any excess fluid is removed. ​2. Drains: These are small plastic tubes that collect the fluid into plastic bulbs. They may be a mild nuisance. However, they are effective at removing seroma fluid. They usually are removed between 2 to 3 weeks. ​1. Compression: Immediately after surgery, you will wear a binder. You will use Spanx once the drains are removed. Finally, when the tissues are better healed, you can use fajas or waist trainers. TIP: The compression should be uniform throughout the area of surgery. 2. Lymphatic massage: Gentle massage may help decrease the swelling of the tissues. This helps drain fluid away from the scar area. Continued swelling after abdominoplasty is not common but possible. Normal swelling may take between 6 months and 1 year as we discussed earlier. 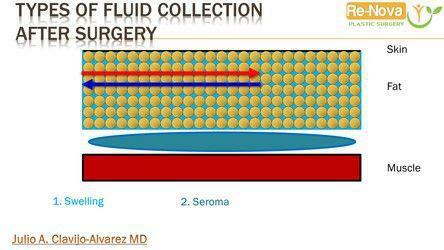 Fluid collection, on the other hand, should not be present after 3 months. Surgery may be needed to remove the pocket of persistent fluid collection.